Hot off the Press: NMWA's Secrets Revealed! People just can’t keep quiet about The Da Vinci Code author Dan Brown’s latest novel, The Lost Symbol, due out on September 15th. The mystery isn’t in Europe this time, though – it’s right here in NMWA’s hometown of Washington DC! Naturally, then, we’re very excited about our newest collections exhibition, Telling Secrets: Codes, Captions, and Conundrums in Contemporary Art, opening on October 9th. The press loves a good secret, too – our exhibition headlines Washington.org’s special page dedicated to The Lost Symbol. Even more fascinating are the allusions to Freemasonry that Dan Brown fans have dug up from the new novel – especially since NMWA itself is a former Masonic temple. USA Today puts us on the map as a hot spot for symbol hunters. So, NMWA fans, to whet your appetite for some downtown intrigue, we’re giving you a sneak peek at three of the works featured in our upcoming show. Enjoy – and don’t forget to tell your friends. Robin Kahn, Victoria’s Secret, 1995. Mixed media on canvas, 68 1/8 x 38 1/8 in. Gift of Maxine Kahn. A staff favorite, Robin Kahn’s Victoria’s Secret, 1995, gives the viewer an elegant and subtle layering of images. The masked figure in the foreground, whom we may assume to be Victoria, quite literally represents her name with Victorian-era styled clothing and a similarly dated cityscape in the background. She is shadowed by a ghostly woman with flowing hair, holding what appears to be a hand mirror – perhaps she knows Victoria’s secret? Alison Saar, Snake Man, 1994. 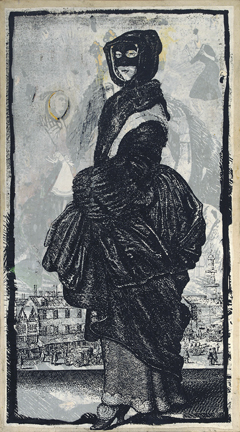 Woodcut and lithograph on paper, 33 1/2 x 42 1/2 in. Gift of Steven Scott, Baltimore, in honor of the artist. American artist Alison Saar is fascinated by images from religion, African-American folk art, and outsider art, often incorporating these visual cues into her work. The arresting Snake Man, 1994, is a stark and puzzling composition with an unsettling ambiguity. One possible reading is an allusion to serpent handling, a ritual practiced in a minority of Pentecostal churches in the southern United States. It is often associated with speaking in tongues, perhaps the reason for the man holding the snake in his mouth. Maggie Foskett, Do I Know My Own Shadow, 1996. Cliché-verre, 19 1/8 x 15 1/4 in. Museum purchase: Members' Acquisition Fund. Telling Secrets: Codes, Captions, and Conundrums in Contemporary Art will be on view from October 9, 2009 – January 10, 2010. Check out our website for more info! A special Telling Secrets contest – with prizes! About the Author: Carolanne Bonanno is NMWA’s Communications & Publishing intern. This entry was posted in From the Collection, News and Updates by Women in the arts. Bookmark the permalink. Cliche verre involves drawing or painting on glass or film and printing the image on light sensitive materials. I don’t see the drawing here. I’m curious so maybe Maggie could let me know if that’s what I’m looking at. I visited the museum today. Please see the sites below to illuminate the painting “Victoria’s Secret” by Robin Kahn in the collection. The painting has nothing to do with Queen Victoria and is after a painting by Hollar done in 1643.